The acting interior minister in the Beida-based government, Colonel Younis Mohamed Belgassem Ismail, has appointed a new security directorate head in Benghazi. The new man is Colonel Rafaa Bsaikri, an engineer from Benghazi. He replaces Colonel Faiz El-Shelmani who was appointed in August. The latter replaced Colonel Nuh Al-Arifi, appointed in May, who in turn replaced Colonel Saleh Mohamed Al-Khafaifi appointed at the end of January. Benghazi has had almost as many security directorate heads in the past two and a half years as there have been interior ministers in the eastern government. Bsaikri is the seventh. Belgassem Ismail who appointed him is the eighth acting interior minister. The ineffectiveness of the holders of both posts in the face of continued violence and lawlessness in the city is said to be the reason for the rapid turnover. “They are expected to do the impossible”, said one local official. Shelmani, though, was accused of being particularly weak. However, the turnover in Benghazi’s security directors is being linked in another way to that of the interior ministers: the successive ministers are credited with wanting to have their own security boss in post in Benghazi. 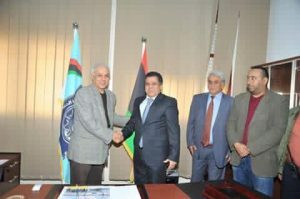 The acting interior minister has also appointed a new head of the traffic department in Benghazi. He is Colonel Hassan El-Shelmani (no relations).